Let's build a small office SIP IPBX server. A Soekris net5501. Great card. I got it for cheap on Ebay. A B410P quadbri PCI card to connect to my ISDN phone provider. Connect to the board using a classic 9600.8N1 serial connection. Update the BIOS normally. 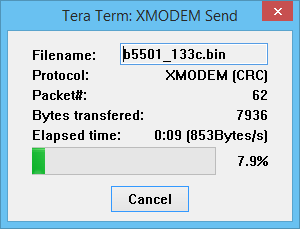 I use TeraTerm on Windows to send the file using XMODEM. comBIOS ver. 1.32i 20071005  Copyright (C) 2000-2007 Soekris Engineering. 5 Seconds to automatic boot. Press Ctrl-P for entering Monitor. File downloaded succesfully, size 784 Blocks. Updating BIOS Flash ,,,,,,,,,,,,,,,,,,,,,,,,,,,,..,,,,.... Done. I'm going to build a tailor-made FreeBSD kernel, including what's needed for the net5501, and excluding drivers that are not needed. hints		"GENERIC.hints"		# Default places to look for devices. options 	GEOM_PART_GPT		# GUID Partition Tables. options 	GEOM_RAID		# Soft RAID functionality. options 	PRINTF_BUFR_SIZE=128	# Prevent printf output being interspersed. options 	KDB			# Enable kernel debugger support. options 	KDB_TRACE		# Print a stack trace for a panic. # The following are not needed, but the kernel wouldn't compile without them. device		tun			# Packet tunnel. device		md			# Memory "disks"
mfsbsd images are great since they can be booted directly using PXE. This will use the kernel and userland made in the previous section. Serves the dist files using HTTP or FTP. I use python to start a quick and dirty HTTP server. The usual pxelinux.0 binary file has problems with the Soekris serial connection (entire screen truncated to 16 characters), so we'll need a patched one, which can be found here: https://centerclick.org/net4801/pxelinux/. Download memdisk. You can find it packaged with syslinux: http://www.kernel.org/pub/linux/utils/boot/syslinux/. Start your favorite TFTP server and boot pxelinux.0 with the Soekris. Start bsdinstall and install the system as usual. When asked what mirror you wish to use, select "Other" and enter the location of your dist files (for instance: http://192.168.4.2:8080). Install the boot loader and set the first partition as active. Exit the shell, and let the installer fetch the packages and do its magic. You now have FreeBSD installed on your Soekris net5501. In the next part, we'll install the ISDN quadBRI card, and connect to the outside world.